At Bauma, Liebherr handed over sixteen crawler cranes to its long-standing customer Bigge. Fifteen LR 1300 and one LR 1800 now join the fleet of one of the largest American crane hire companies. Bigge used the handover at the trade fair to place orders for more crawler cranes from Liebherr. The company ordered two LR 11000. 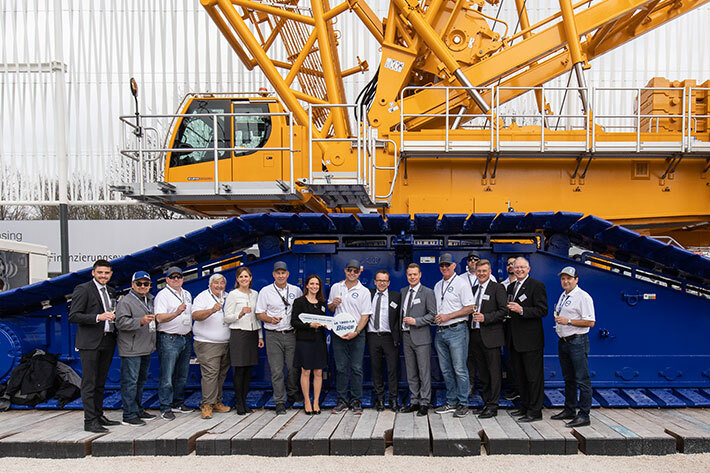 Over one hundred crawler and mobile cranes from Liebherr are already in the fleet of Bigge Crane and Rigging Co. On the second day of Bauma, Liebherr officially handed over the keys for sixteen more crawler cranes to the American crane hire company with its head office in California. The company ordered fifteen LR 1300 and one LR 1800. At Bauma, Bigge also ordered two LR 11000. The staff at Liebherr are delighted with the orders from its long-standing customer – also because many industry insiders consider an order from Bigge as a seal of quality. The crane hire company advertises that it offers its customers the “Perfect FleetTM” with the best cranes in their class. This is how Bigge owner Weston Settlemier also sees his new crane additions: “The new Liebherr cranes LR 1300, LR 1800 and LR 11000 are the perfect addition to our perfect crane fleet”, he added. These are not the first LR 1300 from Liebherr, which Bigge adds to its fleet. Over ten years ago the company started to use two of the Liebherr crawler cranes for lifting activities with a lifting capacity of up to 300 tonnes. Today Bigge operates over sixty LR 1300. The fifteen new models are equipped with a range of newly developed assist systems. As a result, they are not only easier to operate, but also ensure enhanced safety on the construction site. For example, the “Boom Up-and-Down-Aid” assist system shows when the crane is approaching the tipping boarder when lowering or raising the boom or jib. It automatically stops before the crane operator unintentionally maneuver to an unsafe position. With the Liebherr crawler crane LR 1800, Bauma’s largest and heaviest construction machine joins the fleet of Bigge: The LR 1800 incl. the ballast weighs up to 660 tonnes, is eleven meters wide and lifts loads up to 800 tonnes. Bigge ordered the crane not only due to its impressive lift capacities at the luffing fly jib. The transport-optimized design also played a role in the decision for the crane, it shortens the time in which the machine is not utilized between two applications. On the occasion of the handover at Bauma, Bigge announced more orders from Liebherr: The company ordered two Liebherr LR 11000 crawler cranes. The cranes are even bigger than the LR 1800, lift loads up to 1000 tonnes and like the LR 1800 impress with a particularly efficient transport concept.